Fall in the Bay Area means the start of some wonderful overcast days with high clouds all day and little chance of surprise rain. These are great days photographically, as you are not limited to the nice light that ends 2 hours after sunrise. This shot was taken on an overcast day in September. We had family in town and took them to the always spectacular Point Lobos State Reserve near Monterey. Everyone was disappointed that there were heavy clouds around all day, meaning no beautiful blue ocean. But the photographer in me was secretly pleased, as it meant that an encounter like this would be possible -- with no harsh light to be found. That's a beauty. 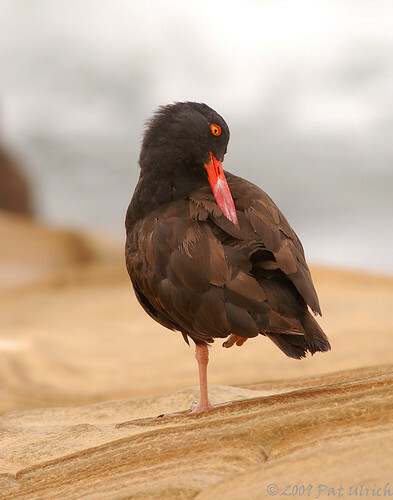 I've only been to Point Lobos once, but I was struck by the large number of black oystercatchers there, especially around Weston Beach. Definitely need to get back down there. Thanks, John. I try to incorporate a stop at Point Lobos into just about any trip I take down to Monterey. During the summer, it can be quite crowded on the weekends -- but in the off season, and especially if you get there early, you can practically have the place to yourself.